When the Spanish conquistadores led by Hernan Cortes were in Mexico in 1520, one of their officers, Bernal Diaz, observed that the emperor Montezuma was drinking chocolatl, a beverage consisting of powdered cocoa beans and ground corn, flavoured with tlilxochitl (ground black vanilla pods) and honey. For more than three centuries after this, Mexico was the leading vanilla-producing country in the world despite attempts to plant the vines elsewhere. Following the discovery of a technique for artificial pollination (about 1841) plantings were setup in Jamaica and other islands in the West Indies. Vanillin, the crystalline component, was first isolated from vanilla pods by Gobley in 1858. By 1874 it had been obtained from glycosides of pine tree sap, temporarily causing an economic depression in the natural vanilla industry. The plant (Vanilla planifolia) is a tropical orchid which grows as a vine and needs the support of trees or poles whereupon it can reach a height of about 5 metres. The flowers have a narrow bell surrounded by thin petals which develop slowly over several months into long narow pods about 12-15 cm long. Vanilla needs a process of curing similar to cacao to develop its characteristic aroma, for example the pods may be picked green then sun dried, oven heated or cured in hot water. During the curing process the flavour precursors, which are glucosides, are broken down into vanillin and glucose and some other minor aromatic substances. Vanilla extract is made by cutting the beans into small pieces and soaking in successive quantities of hot 65-70% alcohol. Many commercial vanilla extracts are now actually blends from natural and synthetic vanillin. The "classical" synthesis of vanillin from eugenol or iso-eugenol was developed in 1896 and it remained the preferred method for about 50 years. The scheme below is a sensitive map with links to the individual molecular graphics (MOL) files. Vanillin is now prepared industrially in large amounts by the Reimer-Tiemann reaction, starting with guaiacol (catechol monomethylether) from which it is formed along with o-vanillin. Not all commercial vanillin is industrial? Another source of vanillin is lignin, a byproduct of paper pulp manufacture. In the May 2000 edition of "Chemistry in Britain", pages 48-50, it is suggested that bio-conversion of ferulic acid to vanillin by liquid cultures of various fungi may be an economical route as well. Ferulic acid has been shown to be a useful antioxidant and derivatives are able to react with free radicals and reactive oxygen compounds. A Mass Spectrum of vanillin in JCAMP-DX format is available. It has recently been shown that the 13C/12C ratio can be used to determine the origin of vanillin. This was done by quantitative measurements of the 13C NMR signals for each of the 8 C atoms. It showed that attempts to fraudulently substitute cheaper synthetic vanillin can be detected even when 13C substituted materials are used. E.J. Tenailleau, P. Lancelin, R.J. Robins, and S. Akoka, J. Agric. Food Chem. 2004, 52, 7782-7787. 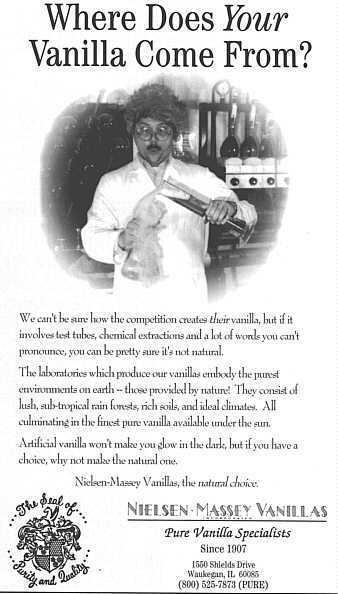 P. Rain, 'Vanilla - The cultural history of the world's favorite flavor and fragrance', Jeremy P. Tarcher/Penguin, New York, 2004. Created Feb 1995. Links checked and/or last modified 17th November, 2013.